An Enterprise Architecture is typically developed because key people have concerns that need to be addressed by the business and IT systems within an organization. Such people are commonly referred to as the “stakeholders” of the Enterprise Architecture. The role of the architect is to address these concerns by identifying and refining the motivation and strategy expressed by stakeholders, developing an architecture, and creating views of the architecture that show how it addresses and balances stakeholder concerns. Without an Enterprise Architecture, it is unlikely that all concerns and requirements are considered and addressed. The Open Group defines three standards in the context of Enterprise Architectures. The Open Group Architecture Framework (TOGAF) standard is an architecture framework. It provides the methods and tools for assisting in the acceptance, production, use, and maintenance of an Enterprise Architecture. It is based on an iterative process model supported by best practices and a re-usable set of existing architecture assets. An architecture framework is a set of structures, which can be used for developing a broad range of different architectures. It should describe a method for designing a target state of the enterprise in terms of a set of building blocks, and for showing how the building blocks fit together. It should contain a set of tools and provide a common vocabulary. It should also include a list of recommended standards and compliant products that can be used to implement the building blocks. TOGAF deals with the Business, Data, Application and Technology Architecture. The central method and repeatable process for developing architectures is the TOGAF Architecture Development Method (ADM). 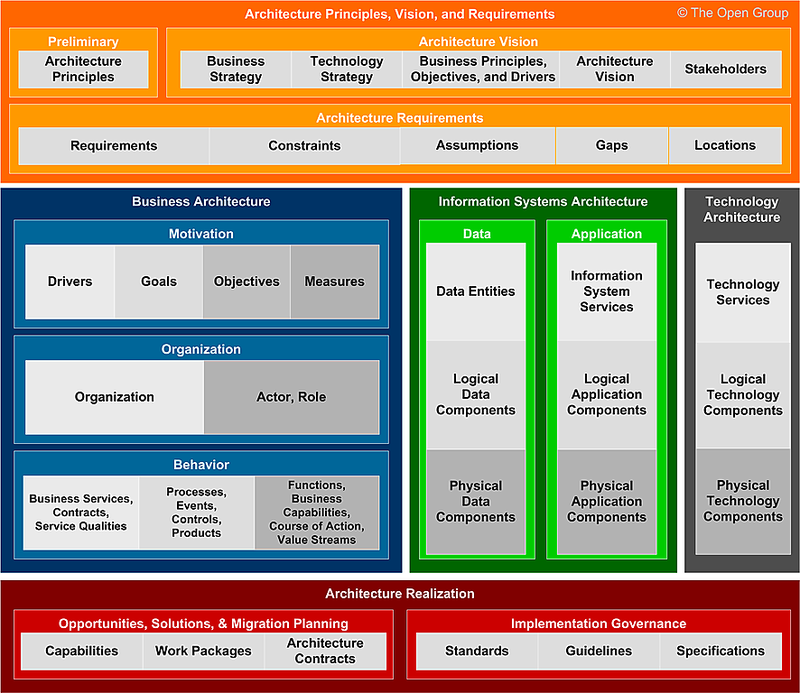 The ADM includes establishing an architecture framework, developing architecture content, transitioning, and governing the realization of architectures. All of these activities are carried out within an iterative cycle of continuous architecture definition and realization that allows organizations to transform their enterprises in a controlled manner in response to business goals and opportunities. Architects executing the Architecture Development Method (ADM) will produce a number of outputs as a result of their efforts, such as process flows, architectural requirements, project plans, project compliance assessments, etc. The content framework provides a structural model for architectural content that allows the major work products that an architect creates to be consistently defined, structured, and presented. The content framework provided here is intended to allow the TOGAF framework to be used as a stand-alone framework for architecture within an enterprise. This standard is focused on transformations to the enterprise or organization. It ensures that the business vision, together with strategy and its implications for structure and operations, is well understood and subsequently well communicated throughout the enterprise transformation lifecycle. These situations are differentiated because theyare different in nature. When applied to decision-making, the Business Architecture practice focuses on holistically understanding the implications of a strategic business idea. At first, stakeholders are mostly interested to understand whether the idea is viable and feasible. During this phase the holistic view is created and alignment and integration of relevant aspects is done. This standard is prepared with the decision-making perspective. When applied to operational design, the Business Architecture practice focuses on elaboration of design as far as is needed to communicate business needs and priorities to designers. Not only do strategic aspects have to be elaborated, but also business-as-usual operations have to be included. As such, it is a more detailed elaboration of the Business Architecture that has been developed during the decision-making phase. How does Business Architecture relate to the TOGAF ADM? It details the ADM method and gives guidance on how to address certain layers of the ADM.
Business Architecture with focus on decision-making fits well into the Preliminary and Phase A (Architecture Vision) phases of the TOGAF ADM and sets direction for Phases B through H.
Business Architecture with focus on operational design for implementation fits well with Phase B (Business Architecture) and the change and feedback cycles. The Business Architect also has a role in the refresh and change cycles. ArchiMate, an Open Group Standard, is an open and independent modeling language for Enterprise Architecture that is supported by different tool vendors (e.g. Sparxsystems, Archi, and Visual Paradigm) and consulting firms. Archimate is a visual language with a set of default iconography for describing, analyzing, and communicating many concerns of Enterprise Architectures as they change over time. The standard provides a set of entities and relationships with their corresponding iconography for the representation of Architecture Descriptions. The ArchiMate language complements the TOGAF framework in that it provides a vendor-independent set of concepts, including a graphical representation, that helps to create a consistent, integrated model, which can be depicted in the form of TOGAF views. The structure of the ArchiMate core language closely corresponds with the three main architectures as addressed in the TOGAF ADM. Both the ArchiMate language and BPMN can be used for modeling business processes. Their aims are different, however. ArchiMate notation is typically used for high-level processes and their relations to the enterprise context, but is not intended for detailed workflow modeling, whereas BPMN supports detailed sub-process and task modeling down to the level of executable specifications, but lacks the broader enterprise context, for example, to model the application services that support a process or the goals and requirements it has to fulfill. The ArchiMate language has derived a number of concepts from UML. Many diagrams and elements on the business, application and technology layer directly correspond to UML diagrams and artifacts, but the use case is a different one. This has an influence on how certain elements are used e.g. ArchiMate serving relationship vs. UML dependency. The focus of UML is clearly on software development and ArchiMate rather focuses on high-level descriptions of Enterprise Architectures.